Lauren Neidig is a veterinarian, currently completing a residency in Laboratory Animal/Comparative Medicine at UW. As an undergrad, she worked on endogenous cardiac progenitor cells, spiking her interest into cardiovascular disease therapies. 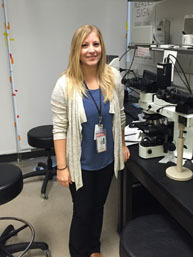 Laurenʼs passion for translational and regenerative cardiovascular research led her to the Murry group in 2015. She is currently utilizing her training to assist with animal care and surgery while she works to developing a project.